The Wisconsin Frog and Toad Survey (WFTS) is a citizen-based monitoring program coordinated by the Wisconsin Department of Natural Resources (WDNR), in cooperation with the U.S. Geological Survey (USGS) and the North American Amphibian Monitoring Program (NAAMP). The primary purpose of the WFTS is to determine the status, distribution, and long-term population trends of Wisconsin's twelve frog and toad species. 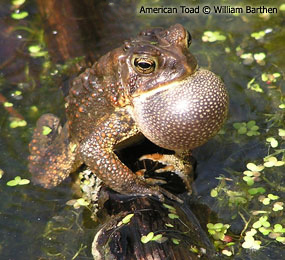 The WFTS was initiated in 1981 in response to known and suspected declines in several Wisconsin species, particularly northern leopard frogs (Lithobates pipiens), Blanchard's cricket frogs (Acris blanchardi), pickerel frogs (Lithobates palustris), and bullfrogs (Lithobates catesbeianus). The WFTS began annual statewide surveys in 1984 and is now one of the longest running amphibian monitoring projects in North America. Phenology surveys have also recently been added to help monitor frog breeding seasons in relation to fluctuating spring weather conditions. Phenology surveys use the same call index and 5 minute calling period as the original surveys, but instead of visiting 10 pre-defined routes three times each year, volunteers select 1-2 sites to monitor throughout the spring and early summer. Unlike the original WFTS surveys that are limited to approximately 2 routes per county, phenology surveys are open to an unlimited number of volunteers.